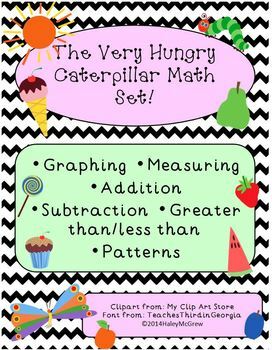 Use these along with the adorable book, "The Very Hungry Caterpillar" by Eric Carle. Great for Pre-K, Kinder and First! 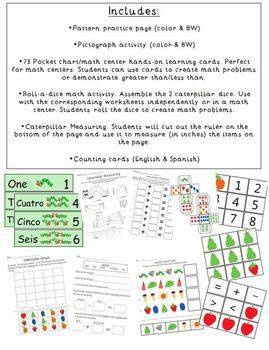 •75 Pocket chart/math center hands-on learning cards. Perfect for math centers. Students can use cards to create math problems or demonstrate greater than/less than. •Roll-a-dice math activity. Assemble the 2 caterpillar dice. 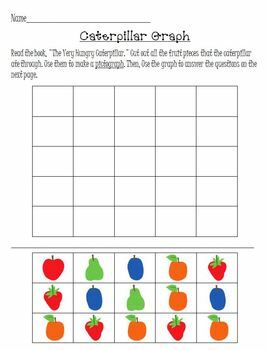 Use with the corresponding worksheets independently or in a math center. Students roll the dice to create math problems. 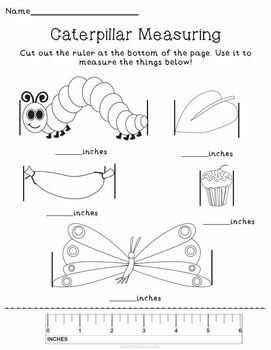 •Caterpillar Measuring. Students will cut out the ruler on the bottom of the page and use it to measure (in inches) the items on the page.